This story was updated at 8:00 p.m. EDT. NASA willtry to squeeze in a launch attempt for the space shuttle Endeavour on Wednesday,just days ahead of a different rocket also set to send two unmanned probes tothe moon this week, mission managers said Sunday. The NASAmoon probes were previously scheduled to fly on June 17, but the agency woulddelay their mission in order to get one more chance to launchEndeavour after a potentially dangerous hydrogen gas leak prevented aSaturday liftoff. A final decision on which mission will launch first will bemade Monday afternoon. ?From apriority standpoint, what we are trying to do in the agency is maximize ourlaunch opportunities,? said LeRoy Cain, NASA?s deputy shuttle program manager,in a Sunday briefing at NASA?s Kennedy Space Center in Florida. A Wednesdaylaunch for Endeavour would occur at 5:40 a.m. EDT (0940 GMT) from a seaside padthe Cape Canaveral, Fla.-based spaceport with favorable weather expected. NASA?s two newmoon probes - the Lunar Reconnaissance Orbiter and a smaller spacecraftthat will intentionally crash into the moon to look for water ice - could thenlaunch on Friday, Cain said. The schedule is tight. If foul weather delays any work on Endeavour or itslaunch pad by even a few hours, the shuttle may not be ready to launch onWednesday. If a delay occurs soon enough, such as overnight tonight or earlyMonday, NASA could swap launch days with the moon mission and try to loftEndeavour on June 20. ?The schedulethat we?re moving toward is very tight,? said NASA launch director PeteNickolenko. ?But it is achievable.? Endeavourwas slated to launch early Saturday from the Cape Canaveral, Fla., spaceportand begin a grueling 16-day space station construction flight. The shuttle?s seven-astronautcrew plans to deliver an external experiment porch for the station?s $1billion Japanese Kibo lab. Five spacewalks and a one-man swap for the station?snew six-person crew were also planned. But a leakof gaseous hydrogen forced NASA to postpone the launch attempt since theextremely flammable gas posed an explosion risk to both Endeavour and the sevenastronauts aboard. Repairs to the vent line leaking the hydrogen should becomplete by early Monday. The leak issimilar to one that delayed the launch of Endeavour?s sister ship Discoveryearlier this year during NASA?s STS-119 mission in March. Shuttle techniciansreplaced the hydrogen vent pipe that siphons excess gas away from the Discovery?s15-story external tank and the mission successfully lifted off after a four-daydelay. While NASAis confident a similar fix will work for Endeavour, shuttle managers remain perplexedby the gas leak. Engineers suspect temperature changes caused by a shuttle?ssuper-chilled cryogenic fuel may lead to gaps in the vent pipe, but they stilldo not know for sure. ?We?llchange it out. It will either work or it won?t,? Cain said of the vent linerepair. ?If it doesn?t, then we certainly aren?t going to go launch.? Endeavour?smission is NASA?s third shuttle flight of 2009 and the second this yeardedicated to space station construction. A May mission by the shuttle Atlantisflew to the Hubble Space Telescope. Commandedby veteran spaceflyer Mark Polansky, Endeavour?s six-man, one-woman crew is thefirst to the visit thespace station since the outpost doubled its population up to six peoplelast month. The astronauts are remaining in quarantine to avoid getting sickwhile NASA decides their launch plan. WhenEndeavour docks, 13 people - the highestnumber ever - will be living and working aboard the station at the sametime. Thedifficulty surrounding Endeavour?s launch date revolves around an overlappingschedule on the Eastern Range, a rocket launch range that extends eastward outover the Atlantic Ocean. NASA shares the range with the nearby Cape CanaveralAir Force Station, which is where an unmanned Atlas 5 rocket is poised tolaunch the two moon probes. Typically,the Eastern Range requires at least two days to switch between a shuttle flightout of the Kennedy Space Center and an unmanned rocket launch from the AirForce station. Clouding the issue even more are the different launch windows forEndeavour and the unmanned moon probes. Endeavour?swindow to launch toward the space station closes on June 20, when sun anglesand heating conditions become unfavorable for a shuttle linked to the outpost.NASA could extend that window to the June 21, but that would require shorteningEndeavour?s busy flight by a day and cutting one of the five spacewalks inorder to leave the station in time, Cain said. The Atlas 5rocket, meanwhile, has a parallel four-day window (June 17-20) in order tolaunch on a trajectory that would allow its Lunar Reconnaissance Orbiterpayload to arrive at the moon four days later. The orbital mechanics line upevery two weeks, but the lunar mission?s launch has already been delayedseveral times since October 2008. 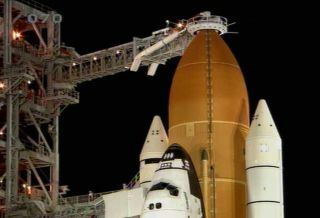 If Endeavour cannot launch this week, NASA?s next opportunity to launch theshuttle would come on July 11, when sun angles and heating conditions at thespace station, mission managers said. That slip should not seriously impactNASA?s plans to launch eight more missions before retiring the shuttle fleet in2010 to make way for its capsule-based Orion successor, but NASA remainshopeful the shuttle can fly on Wednesday. ?A lot ofthings have to go our way,? Cain said. SPACE.comis providing continuous coverage of STS-127 with Staff Writer Clara Moskowitzand Senior Editor Tariq Malik in New York. Click here for missionupdates and SPACE.com's live NASA TV video feed.